It’s possible my children are aliens. Or perhaps that’s just the announcement of the 3rd snow day in a row talking. 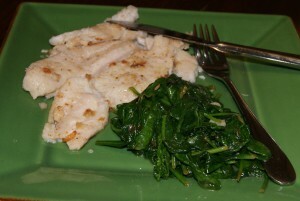 Either way, the four year old cried at dinner that what he really wanted was flounder and wilted spinach. It took me almost a quarter century to delve into seafood, and I’m still blaming the Scarsdale Diet. Somewhere circa 1st or 2nd grade, I’m pretty sure my parents attempted something called the Scarsdale Diet at least a couple of times. All I remember is fish with lemon. Gross. After googling, it appears you are only required to eat fish about twice a week, but that conjured hell on earth for 7 year old me. Luckily my children were born with their father’s palate and will more often than not eat most anything offered. Now that I’m a mature, over quarter century old gal ; ) I love seafood. It’s great for you, quick to prepare, and readily available in my neck of the woods. Since I can’t eat at Neighborhood Services every night, I included my guess at their wilted spinach. I love and crave their wilted spinach, but it’s been pointed out that at times I can be a bit fanatical. At the end of the day, Popeye loves it so perhaps you will too. My flounder came in three fillets at this weight. You can do this in all olive oil if you’re so inclined but it is such a mild fish, I think the butter makes a world of difference. Rinse fillets and pat dry. Season fillets with a generous sprinkling of kosher salt and fresh ground pepper on each side. Heat a stainless skillet over medium high heat for 2 minutes. Add 1/3 of your butter and 1 teaspoon of olive oil, then turn heat down to medium. Allow butter to melt. Brown one fillet for 2 minutes, then flip with a wide spatula. Ensure that the edges are opaque before flipping. Pour 1/3 of juice from one lemon after flipping, then brown second side for 1-2 minutes. Add a 1/3 more of the butter and 1 more teaspoon olive oil then repeat process. The hardest part about wilted spinach is the sheer amount of spinach leaves you need to wilt. When they cook they shrink so much that it’s easy to under prepare! If you’re trying to cook a larger quantity you’ll need a HUGE skillet. You only want the spinach to touch the surface for a very brief time. Heat skillet over medium high for 2 minutes. Add olive oil wait 30 seconds, then add garlic slivers cook about 1 minute until fragrant. Add spinach leaves and flip continuously with tongs. Sprinkle with salt and pepper, toss and pour lemon juice. Toss and serve when barely wilted – less than 2 minutes total cook time! I was a picky eater as a child, and fish was not on my list. But like you…my tastes developed over the years, and now I adore a good filet of fish. This looks just delicious, my friend. I hope you are warm and happy on this cold winter night. Sweet dreams and many blessings! Well I am glad your children do not have your father-in-laws palate. This is certainly a great recipe, over on my site, I have a variation of this using salmon, which is something me and my clients love!